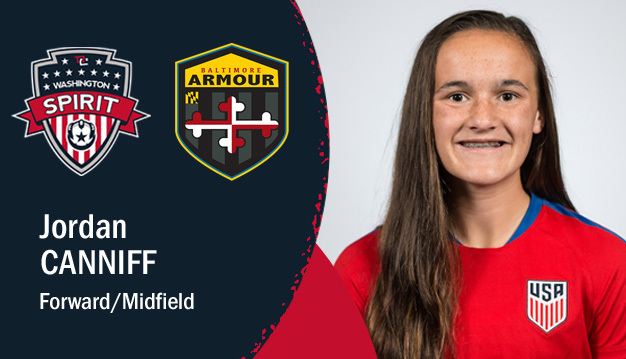 Boyds, MD (January 20, 2018) – Washington Spirit Academy – Baltimore Armour forward Jordan Canniff and the U.S. U-17 Women’s National Team turned in a dominant performance against Venezuela over the course of a two-game set of friendlies to begin their 2018 campaign. Canniff played the full 90 minutes in the opener last Monday, scoring one goal and assisting another during an 8-0 rout of Venezuela at IMG Academy in Bradenton, Florida. With the U.S. holding a 2-0 first half lead, Canniff sent in a cross to forward Kalysa Van Zanten, who finished a short-range tap-in to push the lead to three. Canniff’s 90th minute strike, which finished off the scoring for the USA, was the ninth goal of her international career at the U-17 level, which is the most among all players on the current U.S. roster. The USA went on to shutout Venezuela once again on Thursday, closing out the two-game series with a 4-0 victory.